Local clubs have been paying tribute after Future Lions United Counties League chairman and president John Weeks passed away earlier this week. A popular character and a regular at UCL grounds across the divisions week in, week out, the league chairman died following a short illness. He first became a committee member of the UCL in 1989 and became chairman in 2003 and president this year. As a mark of respect, clubs have been asked to observe a minute of silence ahead of their next games. But such was his popularity, clubs have been paying tribute on social media since the news came through. 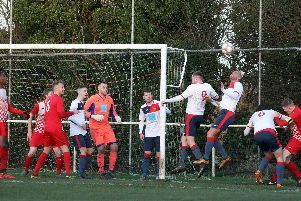 The big UCL Premier Division local derby ended in stalemate on Tuesday night as Desborough Town and Wellingborough Town drew 1-1 at the R Inn Stadium. Will Arnold put Ar Tarn in front but the Doughboys levelled before half-time through Troy Johnston. There were no further goals in the second half but Wellingborough were forced to hold on with nine men after Shaun Wilkes was sent-off for two bookable offences and the Johnston saw red for an apparent elbow. 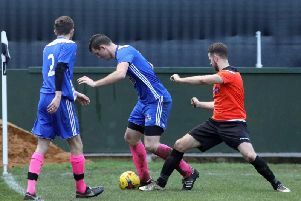 Rothwell Corinthians’ UCL Knockout Cup hopes were ended as they lost 1-0 to Deeping Rangers in the quarter-final clash at Sergeants Lawn. A Luke Hunnings goal proved to be enough to give the visitors the win and a place in the last four. Premier Division: Eynesbury v Cogenhoe, Harborough v Daventry Town, Kirby Muxloe v Newport Pagnell, Leicester Nirvana v Oadby, Peterborough Northern Star v Boston Town, Rothwell Corinthians v ON Chenecks, Rugby v Deeping, Sleaford v Desborough, Wellingborough Town v Pinchbeck, Whitworth v Holbeach. Division One: Blackstones v Melton, Bugbrooke v Aylestone Park, Holwell Sports v Bourne, Huntingdon v Harrowby, Irchester v Birstall United, Long Buckby v Sileby Rangers, Lutterworth Town v Burton Park Wanderers, Raunds v Lutterworth Athletic (2pm), Rushden & Higham v St Andrews, Thrapston v Anstey Nomads.